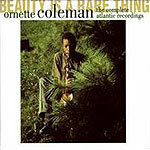 CD review: "Beauty Is a Rare Thing"
The most ambitious box set yet in Rhino's series of reissues of old Atlantic jazz sides, this six-CD package captures the early years of free jazz innovator Ornette Coleman when he was still a pariah to much of the music community. This collection contains all of the surviving recordings from his Atlantic years (1959-61). As blues and jazz historian Robert Palmer's liner notes point out, in retrospect it's kind of hard to figure out what all the fuss was about. While Ornette's music of 35 years ago was someone dissonant, in comarison to what's passed dince it doesn't seem so far from what Charles Mingues, Cecil Taylor and others were doing. Much of the material here features Ornette's original Quartet  Charlie Haden on bass, Don Cherry on trumpet and Billy Higgins on drums. The highlight may be the 37-minute "Free Jazz" that raised such a controversy when it came out. Now, of course, it can be seen that the piece  and Ornette  was firmly in the jazz pantheon, even if at the time it seemed too wild.